This photo has three light zones. The brightest part is on the left hand side, showing hills yonder with their shadows. The middle zone showing the somewhat reddish rock with their many joints as a result of weathering. The right hand zone is dark but still shows the rugged nature of the rock face. It also shows the silhouette of my brother and sister in law walking under the overhanging rock. The picture was taken by my wife while travelling in the South Western part of the States. Altogether, it makes an interesting picture! How much time will it take for a tree to become petrified and turned into fossils ( under the right conditions) ? These photos were taken by my wife while travelling in the Petrified Forest National Park, Arizona in the South West part of the USA. In Petrified Forest National Park, most of the logs in the park retained their original external form during petrification but lost their internal structure. However, a small fraction of the logs and most of the park’s petrified animal bones have cells and other spaces that are mineral-filled but still retain much of their original organic structure. With these permineralized fossils, it is possible to study the cellular make-up of the original organisms with the aid of a microscope. Other organic matter—typically leaves, seeds, cones, pollen grains, spores, small stems, and fish, insect, and animal remains—have been preserved in the park as compression fossils, flattened by the weight of the sediments above until only a thin film remains in the rock. Much of the park’s petrified wood is from Araucarioxylon arizonicum trees, while some found in the northern part of the park is from Woodworthia arizonica and Schilderia adamanica trees. At least nine species of fossil trees from the park have been identified; all are extinct. The park has many other kinds of fossils besides trees. The Chinle, considered one of the richest Late Triassic fossil-plant deposits in the world, contains more than 200 fossil plant taxa. Plant groups represented in the park include lycopodss, ferns, cycads, conifers, gingkgoes, as well as unclassified forms. The park has also produced many fossil vertebrates—including giant crocodile-like reptiles called phytosaurs, large salamander-like amphibians called Buettneria, and early dinosaurs—and invertebrates, including freshwater snails and clams. New Zealand is very photogenic, I guess wherever you point your camera, you have a great picture. The picture was taken by my wife in the Tongariro National Park, New Zealand, on a day when they hiked for 8 hours. I have never hiked for 8 hours continuous. To me, it is a big challenge. Again, the clouds and the lake look fantastic! This week’s challenge is Reward. This is the reward you get if you get there at sunset. The picture was taken by my wife last year when they drove 5400 miles in South West USA. 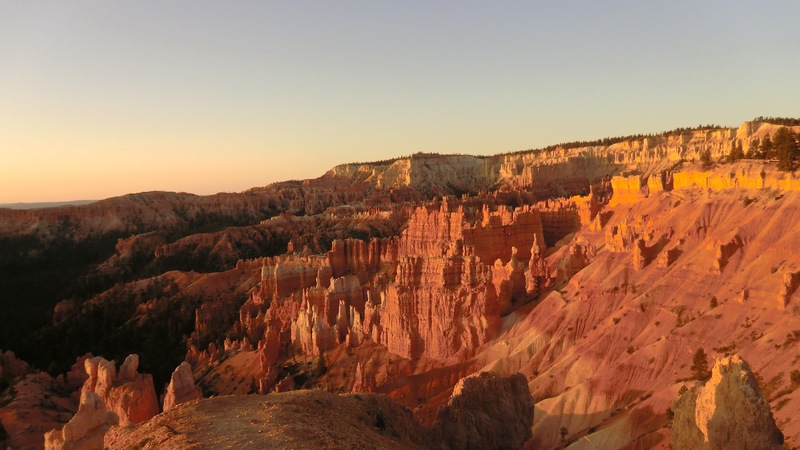 For appreciating the sunset view, they went back a second time to catch the sunset at Bryce Canyon. 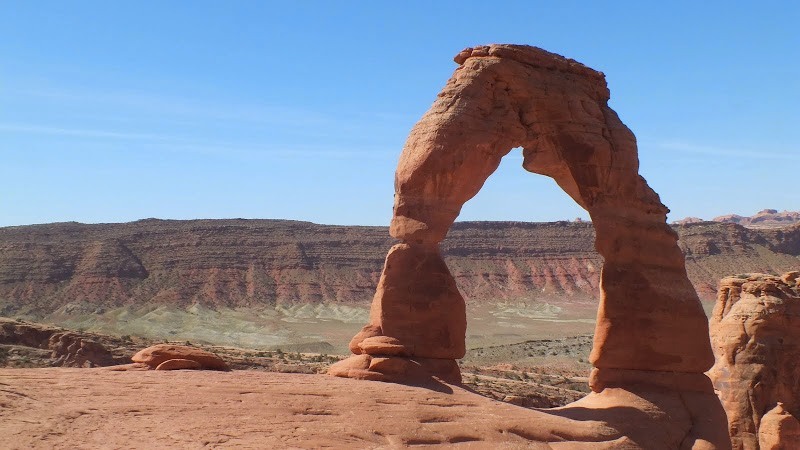 This must be one of the best photos my wife has taken recently in her trip to the National Parks in the Southwest of the States. 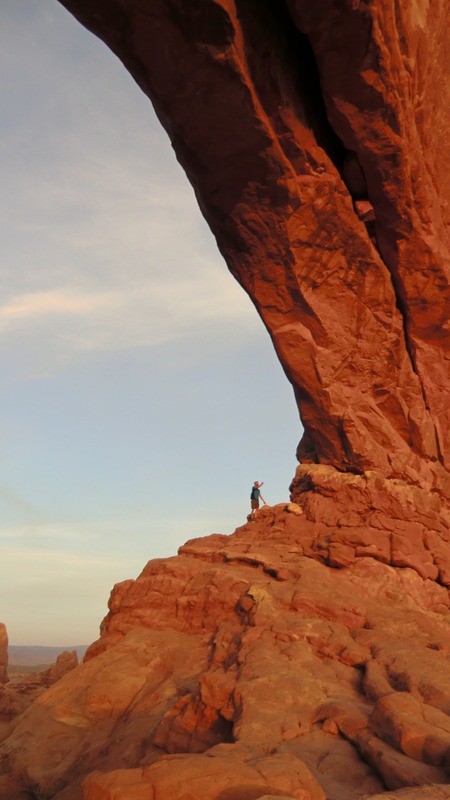 The photo shows a visitor who has climbed up the orange red color land mass and stopped, looking up at the huge inclined landform above him. Behind him was the blue sky. He seemed to be facing a formidable barrier so that he couldn’t hike upwards anymore. 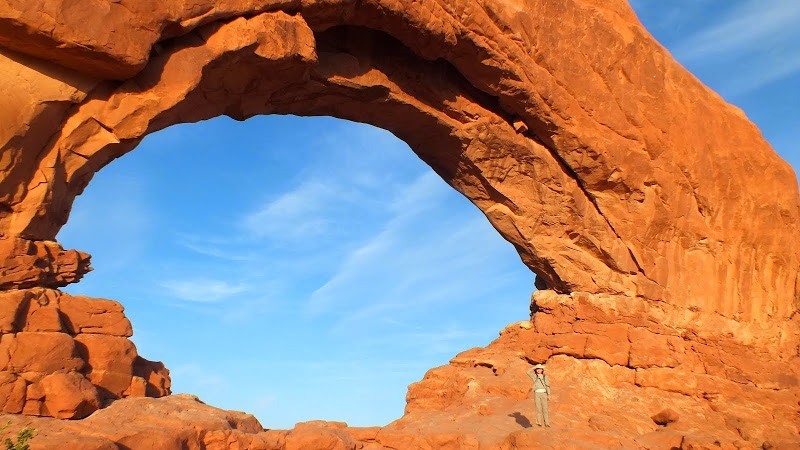 The arch just rose so steeply and at an angle above him. This image shows a big contrast between the huge and strange shaped landform and the small and fragility of the visitor.